New Zealand will go head-to-head with Australia for IRB Junior World Championship crown after both sides powered into the final with victories over South Africa and England respectively. Defending champions New Zealand extended their unbeaten run in the Under 20s competition to 14 games with a comprehensive 36-7 mauling of the Baby Boks at the Estadio El Coloso del Parque in Rosario. Earlier in the day, Australia booked their first final appearance with a 28-16 victory over England. The Tasman rivals will square up at the same venue on Monday in the title decider. A great solo try from Kimami Sitauti confirmed Australia's place in the final after a keenly contested final four clash. 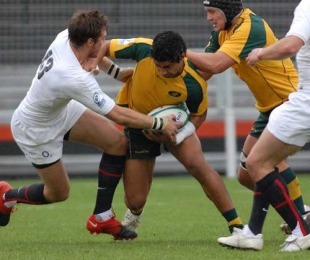 Australia, the youngest squad in the 2010 tournament in Argentina, were already leading 23-11 when the Sevens star backed himself to score, realising his outside backs had overrun the ball and stepping back inside to set the seal on his side's deserved victory. Replacement Jonny May later powered over for an England try but it was nothing more than a consolation score. Australia had not been as clinical as in their enthralling Pool C decider with South Africa four days ago and the problems they had in the lineouts will cause concern, but their free-flowing style still ended England's hopes of a third succesive final. Australia started positively and were unlucky not to score in the opening minute after a jinking run from Robbie Coleman, the Sevens star gliding through the defence only to slip as he stepped off his left foot with the line only metres away. Matt Toomua did kick Australia into the lead with a fourth minute penalty, reward for spending the game to that point in the England 22. However, England hit back five minutes later when Sam Smith got outside his marker on the overlap to cost over to give his side a 5-3 lead. Australia's willingness to throw the ball around was evident and Coleman was at the heart of a flowing move again in the 16th minute, attracting two defenders to him before offloading to Aidan Toua to score his fourth try of the tournament. Tom Homer, the leading point scorer in Junior World Championship history, cut the deficit to 10-8 with a penalty before within seconds Toomua uncharacteristically pulled a kick off his own just inches wide of the upright. Toomua made amends in the 34th minute when he combined with Luke Morahan for Australia's second try, the fullback cutting the perfect angle to slice through the England defence, take the pass from his fellow Wallaby tourist and stretching over the line. Australia looked to have wasted a chance to increase their advantage to 20-8 at half time when Nicholas White took a quick tap, thinking he could get over the line only to be hauled down. Fortunately for him they were awarded another penalty and Toomua made no mistake. England coach Mark Mapletoft rung the changes at the start of the second half, including bringing on prop Lee Imiolek to stabilise the scrum, as he sought to change their fortunes and unsettle the free-running Australians. Australia, though, still spent much of the opening quarter of the second half camped in their opponent's half and it needed some resolute defence from the two-time finalists to keep their try-line intact for the third time at the Estadio El Coloso del Parque. Freddie Burns, somewhat unlucky to have started on the bench, nearly had a similar impact as a replacement as he did against Ireland in the pool stages, a neat chip catching Australia with no sweeper only for Kimami Sitauti to beat him to the touch. Homer cut the deficit to 20-11 just before the hour mark, but Toomua's penalty 10 minutes from time left England needing two converted tries to take the lead. They were unable to cross until it was too late following Sitauti's individual try. New Zealand's quest for a third successive title remains on course after they ran out comfortable 36-7 winners over South Africa in the second semi-final. The 14th consecutive win for New Zealand in the Junior World Championship was never really in doubt after ending the first half ended with the Baby Blacks leading 22-0, having made the most of their advantage of playing with the wind behind them. Patrick Lambie, the leading point scorer in the 2010 tournament with 61 points, missed an early penalty attempt for South Africa and Julian Savea made that prove costly within minutes, the wing handing off Branco du Preez before diving to ensure he remained in touch to score the first try. New Zealand captain Tyler Bleyendaal missed the conversion from the touchline, but having seen Elton Jantjies pull a drop goal attempt well wide, the fly half made no mistake with his next effort to make it 8-0 after 20 minutes. Lambie missed a second penalty and again within minutes New Zealand made the Baby Boks pay, Tawera Kerr-Barlow taking a quick tap to Bleyendaal, whose long pass gave second row Blade Thomson an easy run in for the second try of the match. A third try followed just past the half hour mark, number 8 Rory Grice capitalising on the space that opened in front of him after prop Marcel van der Merwe failed to tackle him to charge over, handing off two Baby Boks in the process. South Africa had struggled to handle the Baby Blacks from the first whistle, but were also guilty of wasting several opportunities with handling errors. However, they finally got on the board in the dying minutes with a try from Du Preez, the smallest player in the 2010 tournament. The Baby Boks, who have suffered semi-final heartbreak in the two previous Junior World Championships, may have had the wind in their favour in the second half but they were unable to find a way through be it because of handling errors or the resolute New Zealand defence. Instead it was Bleyendaal who kept the scoreboard ticking over with four penalties, making the Baby Boks pay for their high penalty count, before Savea scored his eighth try of the tournament 10 minutes from time, carrying defenders over the line and again showing great special awareness to dot down before going into touch. Savea, who had been a doubt in the days leading up the match with the knock he suffered to his hip against Wales, has now matched the eight tries Zac Guildford scored in the 2009 tournament. In the day's other games, Ireland beat Samoa 37-10 and Scotland accounted for Tonga 28-8 to set up an all-celtic clash for 9th place. Elsewhere, Wales lost out to Argentina in a penalty shoot-out after the sides drew 19-all and the South Americans will play France in the 5th place final after they beat Fiji 44-9. England will tackle South Africa in the 3rd place final.